Tired of the same old lines? Give them a new twist with this hilarious collection. And although they may not help you in your quest for companionship, you're sure to get a lot of laughs in the meanwhile as you arrange and rearrange these words and phrases. 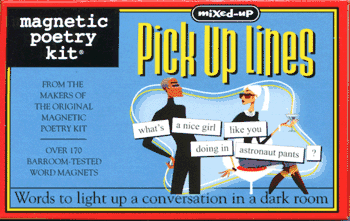 Reinvigorate your barroom banter with our Mixed-up Pick Up Lines.